October last year, we brought you the news of a horse and its rider popping down to a Welsh branch of McDonalds for a couple of McSugar cubes. Last week, there was the story of another Welsh man trying to take a pregnant pony onto a train. Today? 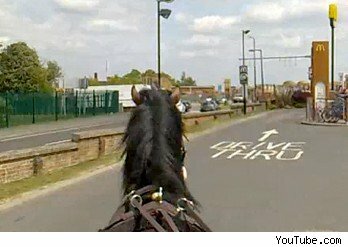 It's a lady on a horse and cart who got turned away from a Derbyshire drive through – but managed to find a KFC who would serve her down the road. McDonald's said no to Debbie Murden, 42, from Pinxton in Derbyshire, because of 'health and safety reasons' saying that they can only serve certain vehicles – not including horse and carts, it seems. "They said it was dangerous," Debbie said. "I'm not sure who they meant it was dangerous for, them or us or other people in the drive-through. But there was no danger there." "I got in touch with McDonald's head office and asked why, if horses and motorbikes are not allowed through, are there no signs to say so? And why is it different from branch to branch?" "We're sorry to have disappointed Ms Debbie Murden and for any confusion caused," said a McDonald's spokesperson, adding: "The health and safety of our customers is our top priority and for this reason we are unable to serve customers in a horse-drawn carriage." Ah, what party poopers these McDonald's types are. They should learn to enjoy horses, be they in cars, dragging people along on skateboards or boasting ludicrous names. They really are a fun animal, and no mistake.